Susan made this soup for me 30 years ago, and it is still one of my favorite soups! 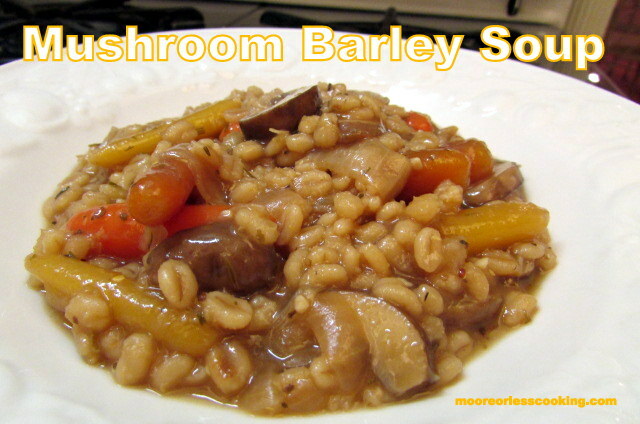 She used Cremini Mushrooms and baby carrots, so delicious! We had a girls night and she served cheeses and crackers as an appetizer. Perfect comfort meal on a crisp Fall day! Takes under an hour to make! In a Dutch Oven on medium heat, saute onions and garlic with olive oil until soft, add carrots and mushrooms and Bouquet Garni. Add water, barley and salt. Bring to a boil, reduce heat and cook for 40 minutes covered. two of my favorite things!! Adding soy sauce sounds good! I bet with your freezing temps, this soup is a welcome sight! Nettie, this looks incredible. Pinning, Yumming and SU’ing.